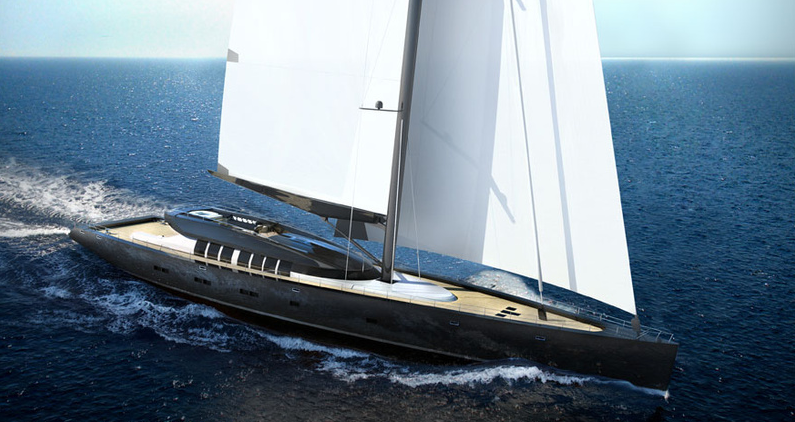 Overview: Najade is a large, modern and fast vision of the actual decks house performance cruisers. Important is clean, well-organized deck, all captive winches are covered under the main deck with an easy access for maintenance, anker and mooring gear is also hidden under the fore deck. A large tender is sheltered in the aft garage at the transom. The decks house is not recessed as on many boats at that size. Here the main deck has one level. 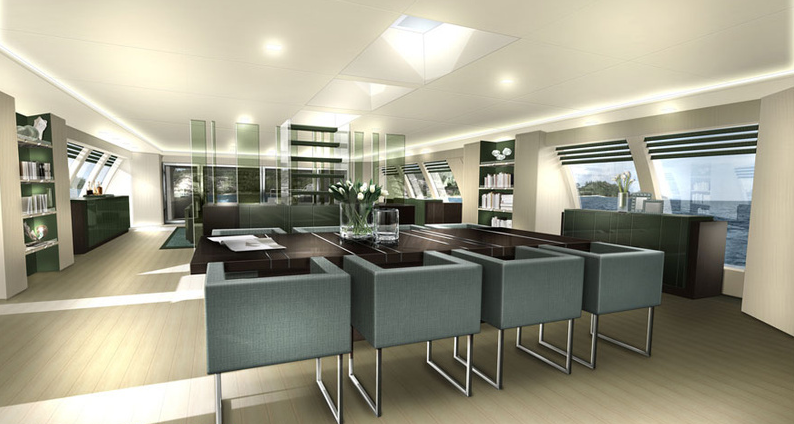 The amount of space differs from other yachts in her range that shows the main salon with its indoor/outdoor concept, providing as much as possible light into the salon by large, full height windows and an amazing sky light roof. As a standard, the main helm station is on the sun deck, but if the captain needs to steer from inside, a fully equipped wheel house is in front of the dining area. Further the sun deck incorporates a 4 person jacuzzi and sun beds for lounging while enjoying the sail. The inner general arrangement of the lower deck offers besides a spacious crew area four generous guest cabins with en-suite bathrooms, a luxurious owner’s suite with a dressing room as well as his and her bathroom. Furthermore a comfortable TV lounge and a gymnasium take care of guest entertainment on this deck. The interior of the main deck provides an airy salon area and a forward dining next to buffet and bar. The unusual full height windows to both sides of salon and dining allow the surrounding elements of sea, wind and sunlight to flood the space and to complete the interior philosophy with its natural beauty.